Colleen M. Story is a writer/editor/ghostwriter living in Idaho. She enjoys working on health and wellness projects for her clients, and adventures with her fictional characters as frequently as possible. Find more about her at www.colleenmstory.com, or read her blog at www.whoozvoice.com. This brings to mind the movie, “The Saint.” If you haven’t seen it, there’s a scene where the Val Kilmer character disguises himself as a tortured artist, and describes himself to leading lady Elizabeth Shue as “just a traveler.” (He was totally deceiving her, of course.) I can say that I’m a writer, which is the title I’m most comfortable with, but I’m also a daughter, a sister, a teacher, a musician, a caretaker, an animal lover, a researcher, a dreamer, a seeker, and a health nut, which all describe parts of me. Under all those identities is the “witness,” the one who travels alongside and watches everything, and learns (hopefully!). At the risk of sounding too “new age-y,” I think we’re all just learning as we travel along here, and that’s the description that feels the truest to me now. I’m a traveler, learning as I go. No contest—my mother. From my earliest memory, she was the light in my life. When I was young, she was the comforting presence who lit up the room whenever she entered. Many of her friends call her “Sunshine.” Later, I came to know her as a very strong woman, someone I could look up to in terms of how she had faced the difficult times in her life and overcome with a constant and abiding strength and concern for me and my three brothers. Today, she is my biggest cheerleader, and the first to tell me that I will succeed at whatever I’m trying to do. She inspires me to live life to the fullest, and to always find the humor in things. I count my blessings every day that I’m healthy and my family is healthy. Looking back, my biggest challenge to date was probably my divorce. It was an amiable separation, but still a time of grieving. I was lucky enough to land a wonderful new writing job right about the same time, and the people there were some of the best quality folks I’ve ever met, which gave me a solid new foundation from which to spring forward again. My father’s lung cancer and eventual passing was also very challenging for me and my family, but I don’t think that losing a loved one is really a challenge you overcome. Instead, you gradually learn to cherish the memories and shift into a new place of relating to that person who was so important in your life. A more constant challenge for me—and I think I share this with a lot of others—is how to best manage my time. I don’t think it’s any big secret that our new technology is not making our lives easier, just busier. Because there are so many distractions, and because a lot of us are working more than 40 hours a week now, we’re not getting enough sleep, we’re finding it hard to squeeze in time to exercise, and we’re shortening or foregoing our vacations in favor of something else we think we have to do. Consequently, we’re ending up unhealthy, overweight, and unhappy. I make a point to step back and reevaluate my schedule whenever I feel my health, creativity, joints (! ), or family time slipping away. I write down what I’m going to do each hour of the day, each day of the week, and try again. It’s not something I overcome and move on—it’s a constant challenge that requires frequent attention. But I do find that as I become more aware of where my time is going, I become better at using it to fulfill my priorities. To trust in myself. This advice came to me initially from some special school and music teachers I was fortunate enough to know, who saw much more clearly than I what my individual gifts and talents were, and encouraged me to trust and follow them. For the longest time, I found it difficult to believe that the little voice speaking inside me was usually, if not always, right. I later learned that I’m not the only one. Women, in particular, since we’re used to putting others’ needs ahead of our own, find it hard to go out on a limb, take a risk, or assert ourselves just based on our gut feelings alone—particularly if it means ruffling others’ feathers or going against someone else’s opinion. We hate to be a bother or hurt other’s feelings. But it’s when I’ve followed my instincts without question—just jumped in with both feet based on what that little voice was telling me—that I’ve experienced the greatest rewards. I write about this subject on my blog, “Whooz Voice.” Whose voice are we listening to, when it comes to what we’re doing in our lives? Too often it’s not our own. It’s that of our parents, our friends, our spouses, our peers, our culture…echoes of what someone told us yesterday, or years ago…and we are afraid to break out, because that means we might have to go it alone, and we might be wrong, and what then? But facing those fears gets us where we’re meant to go, and the rewards are always worth it. Isn't she beautiful? 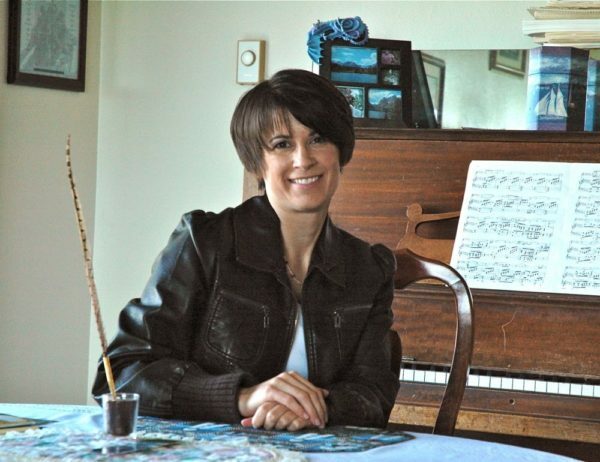 If you want to learn more about Colleen's amazing life, vist her at colleenmstory.com or visit her blog at whoozvoice.com!